You can use the Eureka 96H for any kind of cleaning task. As a stick vacuum, it gets the job done fast and easy, but this is not all. 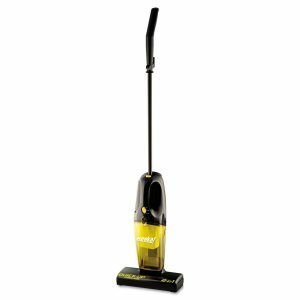 It quickly converts into a handheld model, so you can clean above the floor areas whenever the need arises. Since a thorough cleaning session should involve cleaning such areas, the Eureka 96H is a great buy. Since this is a battery powered model, you will need to recharge it once its battery is depleted. The biggest downside is that it takes the battery quite a lot of time to recharge, so this aspect may put you off when considering a stick vacuum like this one. A great feature of this vacuum cleaner is that it can be converted into a handheld unit when you need it for small tasks on the spot. As a stick vacuum, you can use it on all the surfaces inside your home. Above the floor surfaces, on the other hand, are not as easy to clean without the right tool. For this, you will just have to remove the handle and you will have a hand vacuum, ready to serve. The cordless design helps you clean up accidental messes that can make your home look like it has just been through a major disaster. Especially if you have kids and pets, cleaning up after them can be a real hassle. With the help of the Eureka 96H, you will manage to keep everything nice and clean, just as you like it. Convenience is important when you need to perform short cleaning tasks. The telescopic handle, for instance, allows every user in the house to customize it for their own height. This can be particularly useful if there is more than one person handling the cleaning on a daily basis. 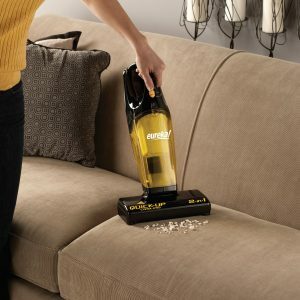 Because this is a cordless vacuum, you can move around and clean fast, whenever you need to do that. The battery lasts for 12 minutes when the vacuum cleaner is set on the highest setting. The wall mounted charger will minimize the space needed for recharging the cleaning tool. Other convenient features worth mentioning are the dust cup that is really easy to empty and the brushroll system that can be raised or lowered, depending on what kind of surfaces you are cleaning. With a 10 inch wide cleaning path, the Eureka 96H is a good choice for cleaning small messes. While you cannot expect this cordless vacuum cleaner to perform as well as a full size model, you can still depend on it. Even larger debris can be captured by the wide cleaning path, so you will not have to work hard to clean everything that needs cleaning when small accidents take place inside your home. Affordable and easy to use, this vacuum cleaner offers you plenty of cleaning time and decent cleaning path, so you can perform small cleaning tasks without any trouble.